Janmarg system's map includes multiple languages. Photo by Prajna Rao. 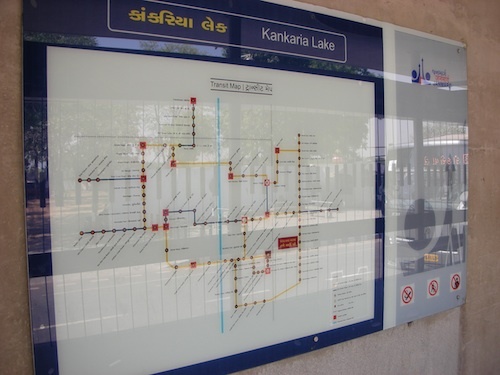 Last week, Prajna Rao, a transport planner at the Centre for Sustainable Transport in India (a member of the EMBARQ Network, which produces this blog), posted a photographic tour of Ahmedabad’s new bus rapid transit (BRT) system, known as Janmarg. Since Janmarg is making a name as a “best practice” for mass transit in Indian cities, we at TheCityFix wanted to delve a little deeper into how it works. Here, I talk with Prajna about how the system deals with accessibility and signage. My previous work with the Johannesburg BRT, Rea Vaya, focused on these topics, which are key to maximizing ridership, comfort and inclusivity. TheCityFix: What kind of visual or audio announcements are there in the stations? Are the arriving buses announced? How many languages are used? Prajna Rao: LED panels and audio announcements tell commuters when the next bus will arrive. Both systems are trilingual, using English, Hindi and Gujarati. PR: There is only one route in operation, so this hasn’t been a problem so far. My guess is that when Janmarg expands, planners will choose flexible bay assignments with dynamic information systems, either by way of audio announcements or station attendants. It may be a good idea to utilize the vast human resources we have instead of a technology that might be expensive to implement. TCF: It looks like there’s just one inbound and one outbound turnstile, plus a gate for people with disabilities. Do you know if the limited turnstiles have led to crowding during peak hours? PR: So far, the BRT runs on a corridor that avoids the city centre, so it hasn’t seen unmanageable crowds yet. Also, the turnstiles haven’t been used yet because the smartcard system hasn’t been introduced. For now, paper tickets are being issued manually. But we do suspect that the turnstiles might eventually be insufficient. Planners are studying this issue for the other corridors that expect higher ridership. TCF: The tactile strips are a nice feature for visually impaired users. Are they common in India? Johannesburg BRT planners wanted to include them, but were concerned that blind persons aren’t accustomed to them since they aren’t a standard feature. PR: This is one of the first initiatives towards inclusivity for the visually impaired, so there aren’t really any standards. But they were included in consultation with the Blind Peoples’ Association (BPA), which also has its own dedicated bus station on the corridor. 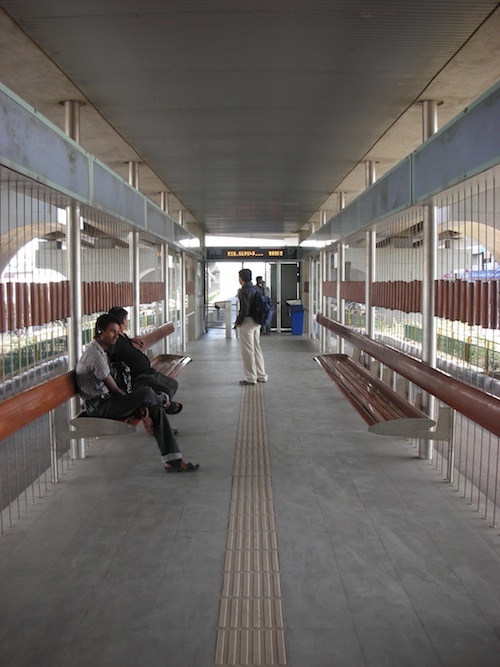 After consulting with the Blind Peoples' Association, Ahmedabad's BRT planners incorporated tactile tiles to guide visually impaired users through the stations. Photo by Prajna Rao. TCF: It appears in the photos that there are tactile pavers where the ramp slope begins, also a universal accessibility best practice. Did the project have an accessibility consultant? Do the state or national governments have accessibility requirements? The tradeoff between increased accessibility and cost can be a difficult one. PR: No, there are no requirements here. The planners conferred with the BPA on provisions. Each station cost about 44 lakhs ($95,000) each, which is an incredibly high amount to spend on a BRT station in India. Given that level of spending, these tiles would have amounted to a very small percentage, so I don’t think the cost of these elements was an issue. TCF: The bollards pose a challenge. You want to keep motorbikes out, but allow wheelchair users in. The spacing between the bollards seems narrow. How easily can wheelchair users pass through? PR: That has been an issue of concern for the longest time here, due to challengers from motorbikers. We haven’t been able to sort this out yet. TCF: How is the lighting at night? There’s no visible overhead lighting, and with the stations located under an overpass, I wonder how well-lit they are. PR: They are actually pretty well lit. 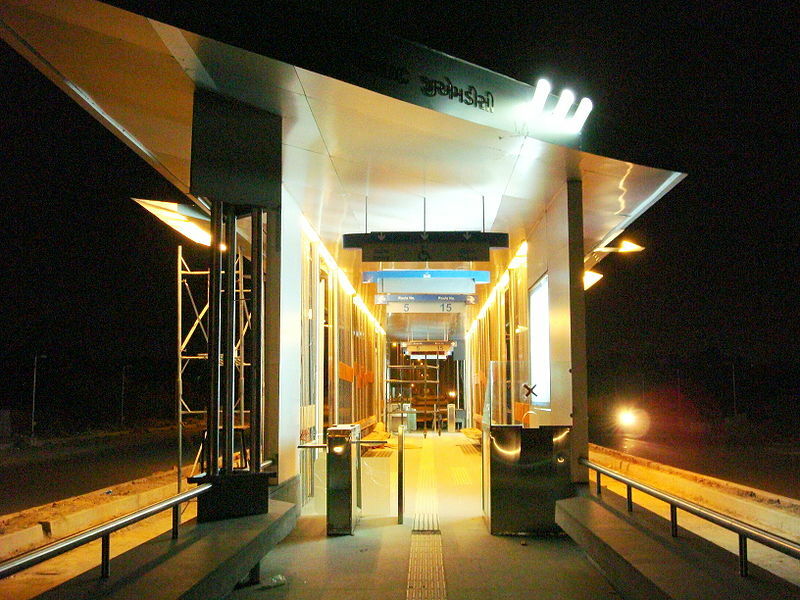 Here are some photos taken of the BRT at night. Janmarg stations are well-lit at night. Photo by Rahul Guhathakurta. TCF: Are there concerns about street vendors encroaching on the median pedestrian spaces outside the station? Johannesburg BRT planners decided to create “no vendor” areas around stations. There is high foot traffic there, so that’s where the vendors want to congregate, but you don’t want them obstructing the passengers/stations. PR: No, not yet. The Municipal Corporation has hired about 180 BRT marshalls (ex-army men) to make sure BRT is prioritized at traffic intersections. These people also keep out other street activities that might obstruct the system.